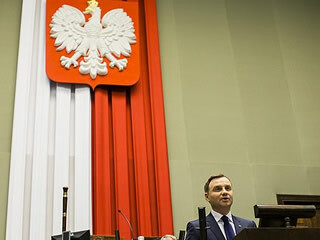 Polish President's Speech - Andrzej Duda, President of the Republic of Poland. Dear Compatriots! I am very touched. Thank you very much. Thank you for being here with me in this hall. Thank you for being witnesses of my presidential oath of office, this is very important to me. I also wish to thank my compatriots, the ones who stay close to here but also those who are far away, even beyond the country’s borders but who are with us today by means of the mass media, including also the Internet, who are with us in their hearts. Thank you for being with me and for giving me support. I wish to thank my family, friends and well-wishers all across the long campaign which is now far behind us. I wish to thank all of them who are with me today. I wish to thank all Polish women and men. My words of thanks go to my predecessors in office, the Presidents elected by the nation in democratic elections. But especially I would like to thank the President who is no longer with us today. I wish to thank President Professor Lech Kaczyński. You may recall that in my inauguration speech during the first convention opening the election campaign, I said that my upbringing, my university studies, and my doctoral studies, they had all led me to meet him. They all led me to him, and at his side, I started to mature, to engage in politics, the politics understood as a common good, meaning the weal of the people, the weal of the Polish state, a just state in which all citizens are accorded an equal treatment, the state which stands up for the weaker and has no reason to fear of the strong ones. I can say that the road which had opened up back then, the road which I was describing in my election campaign at the meetings with my compatriots, has brought me here today. Since it was them who elected me to the office of the President of Republic of Poland, the office which I am inaugurating today. Standing in this very place I wish to tell you one thing: thank you for election, thank you for your presence. I wish to assure you that I will spare no effort not to fail these expectations. I will keep the promises which I have made even if today many people doubt it. But I am unfailing man and a man of faith. I do believe this is attainable, I believe I will manage to attain it. First and foremost, the most important ones: the pledge to draft and submit a bill raising the tax free threshold in order to alleviate the poorest. The pledge to submit a bill on the lowering of pensionable age. I do recall it. I have not forgotten having already been elected to the office of the president. I am not forgetting my promises, and I will pursue the others together with the National Development Council. I trust I will have a public following on that count but I also trust that I will find support in this House. For the Polish people were relating to me their concerns, their problems but were also telling me what kind of Poland they would like to see. All of this they were telling me at the meetings, many people were approaching me. I was responding them and finding out from them what is that Poland needs today. This was a first-hand knowledge derived from direct contacts with them. Ladies and Gentleman, today I wish to very strongly emphasize that one of such basic expectations is that we start rebuilding a sense of community. 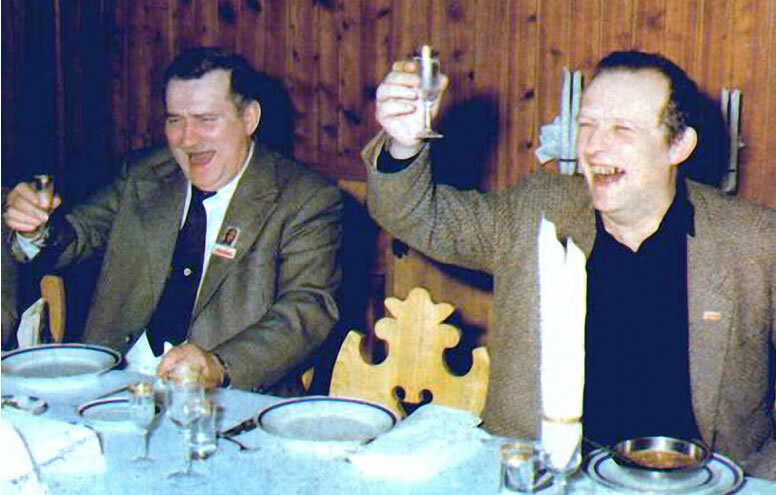 People dream of such a community, the one that was forged among the Poles in the 1980‘s, in the times of Solidarity. And this is why today I appeal to people of different views, different outlooks, believers and non-believers alike. I ask for your mutual respect. What I ask is that we respect our rights without imposing them on other people, so that we know how to mutually respect those rights. I beg you to respect each other, I am mentioning this especially here, in the parliamentary hall. I am addressing Polish politicians but I am also directing these words to myself. I would like for us to build mutual respect, for it is respect that must underpin a community. And only once we are a community we shall be able to reform Poland, and Poland nowadays and especially Polish people need such a reform urgently. And this necessity applies to many areas. Including healthcare, everyday standard of life of many families, including children many of whom are nowadays undernourished, especially in rural area. They need assistance, as you Ladies and Gentlemen, realize fully well. This also includes young people who emigrated since they could not see any prospects for themselves in our own country. We must lend them a hand, we must start repairing the Republic of Poland. It is my profound belief that in this hall there are many politicians who share this will, many politicians who also pay heed to citizens. I wish to guarantee today that I will be indomitable in my action in this direction. I shall rely on good cooperation with the Government. I shall rely on good cooperation with the Sejm and the Senate, and on external issues I also trust on good cooperation with the European Parliament and with our representatives in high ranking positions in the European Union. I trust we will serve our Home Country together which is a matter of great import today. We shall serve the Home Country equally in national and in international space. In the latter we have two great success to our credit made in the last 26 years. We managed to gain our freedom, we acceded NATO, and we are members of the European Union. In their prevalent majority, the Poles are satisfied about it. This is a great achievement which was attained because we moved, not only symbolically, but also in real geopolitical sense from the East to the West. Nowadays, we live in different conditions and in a different state than it was the case before 1989. Polish foreign policy which should not be exposed to any revolutionary changes since foreign policy does not like revolutions but it needs an adjustment. This adjustment consists in stepping up our activity. This adjustment is about articulating our goals, speaking about our aspirations. It is about presenting our point of view in a steady but decided and unambiguous manner, by communicating it to our partners in international space. This way, we should also care for cohesion of the European Union so that in the process of developing this cohesion also our own interests would be taken into account. This way, we should build the unity of the North Atlantic Alliance and guard it carefully since it is crucially important to Poland. The second issue is security, in particular military security. What is most important in this regard is building a strong, well-equipped Polish army. This is a task of paramount importance for the nearest years to come since this is the most fundamental guarantee of our independence, sovereignty and security of citizens. This is a great task in store for all of us but in particular for the President who as a Supreme Commander of the Armed Forces is to cooperate with Minister of Defence in peacetime. In this respect, there will be cooperation on my part but there will be activity as well. I trust that we will be able to jointly work for the benefit of the Republic of Poland there. In the nearest time perspective, this also involves the reinforcement of allied guarantees in the North Atlantic Alliance of whom we have good fortune to be a member. In this regard, we need to make our point unequivocally. We need stronger guarantees from NATO. Not we as Poland but the whole Central and Eastern Europe whose current geopolitical situation is challenging, as you well know, Ladies and Gentlemen. We need greater NATO presence in this part of Europe and in our own country. I have already initiated talks on the subject since in my capacity of President-elect, I have had the opportunity to meet representatives of other countries, our NATO Allies, and also representatives of the North Atlantic Alliance. This is crucially important to me. I would like to achieve it within the framework of the initiative which I have already mentioned, the Newport Plus initiative. So that at the nearest NATO Summit to be hosted in Warsaw in 2016, we would be given such unequivocal guarantees. This requires intensified diplomatic effort but I believe that we shall be able to achieve this goal as well. International politics involves, first and foremost, proper relations with one’s neighbours, something which requires particularly close attention and care. Good-neighbourly relations are important, they enhance security. We should also take actions in this direction. Wherever the situation is difficult, we should double our efforts. But we should also talk to our partners in Central and Eastern Europe, spanning from north of the Baltic Sea basin and down to the Adriatic. We must look for what we have in common. Likewise, we need to look for the elements which unite us also in the international dimension. We must build a community. This is yet another element which is now very urgently desired by the Polish people. Good relations stand as a guarantee for peace and security. I believe this is a great desire of many Polish people who would like to see it as one of the outputs of our European Union membership. We should try to enhance it and our policy in this respect needs further momentum. This includes rebuilding or a renaissance of the kind of the Visegrad Group but also attracting other partners. Seeking agreement with them. This is the task for the nearest years. In line with the Constitution, as President of the Republic of Poland, jointly with the Minister of Foreign Affairs and Prime Minister, I am ready to take on this task and I will. Foreign policy is not only the large-scale policy, not only the European or global policy. It is also the smaller scale policy directed at the Polish people, the Polonia, our compatriots. There are millions our compatriots scattered today all over the world. What they need is a closer contact with Poland. What they need is initiative on the part of ruling authorities. In this connection, I have made decision on setting up an Office for the Polonia and Poles Abroad within the Chancellery of the President in order to pursue those tasks more actively. Among the Polonia and the Poles abroad, there are a few groups of people. One of them is the Polonia community whose leaders often occupy prominent positions in politics and in business communities in some countries. They think about Poland, they feel Polish, they want to help but they need a link to the old country, they need someone who will reach out for them, they need to be engaged in cooperation for the benefit of Poland. I want to take up this action. Among them, there are many young people, many young Poles who were born aboard but who continue to remember about Poland since they were raised in polish tradition. But these are also Poles who were left over in the East in the wake of the shift of the borders decades ago. Also the ones who were subject to deportation to the East. Many of them would like to return and this is a challenge of, so to say, a historical import to the Polish state. This is a test case whether we can make this dream of many of them come true. Today they need support, they must be supported in order to able to promote Polish culture there, in order not to make young people forget about Poland. This is a great challenge for the state, also in financial and organizational terms. This assistance is very much needed. I will initiate decisive actions going in this direction, too. But there is more than that, Ladies and Gentlemen, for today the biggest problem we have are young people who have been leaving Poland for years now. In pursuit of employment, dignified life, opportunities for themselves. I know that a great task in store, and I have mentioned this fact on many occasions, is to boost Polish economy, to improve the standard of living in Poland, to help Polish entrepreneurs so that they no longer say it is an oppressive state for them. So that they are afforded more freedom, more room for their operations and so that they could benefit from support from the state readily available to them when needed; so that they do feel the state is setting traps for them. They should create new jobs, they should build prosperity for it is small and medium enterprises who our greatest treasure. But before we lay down such conditions among ourselves, and this will not happen overnight, we should stay in touch with the young people who left abroad and who consider returning to Poland whenever an opportunity arises in order to use and develop their creativity and draw on expertise they have gained outside the country. The link to them. I have visited and talked to people in London, Brussels, in other places and I can tell you the following: they need support nowadays, especially as far as Polish education is concerned, so that their children could learn Polish language and Polish history, so that they could receive instruction in Polish. Today teachers who reside there and teach there say: “we would like to enjoy the same status as teachers in Poland, we teach Polish children, after all, we deserve it, and does not the Polish state understand it?” We need to take all those issues into account, we must stay in touch with those people and take care of them. This is why Polish diplomatic missions should be reinforced, our activities vis-a-vis the Polonia community should be stepped up but also activities targeting Poles abroad, and this regardless of the effort to create condition for them to be able to return to Poland. It is also Polish culture which should be exported to them in order to lend support to their expectations and to support their aspirations. But we also must support culture in here, in the country. Today many artists and authors say that they have been left stranded, that they cannot achieve self-fulfilment, that their works are of no avail, and that sometimes they cannot create for the scarcity of funds, their standard of living being low. Institutions of culture keep disappearing, especially on a grass-root district level but also in big cities. I would like to put an end to the often repeated statement that district-level Poland is being wrapped up. Today Polish culture requires patronage, a patronage from the state. It will certainly have a patron in the person of President of the Republic of Poland whose office I am assuming. John Paul II, our great compatriot, used to say: “You must demand this of yourselves even if others do not demand it of you”. And I will note the following, Ladies and Gentlemen, today they demand of us. They demand of us, I kept hearing this every step I took for the last half of the year. They demand of us, they demand of politicians. We should stay together and we should jointly serve people. This is a big task in store for the nearest years. It is primarily in store for me, for the President of the Republic of Poland but I hope I will gain your support. Also in historical policy, for nowadays Poland often needs to be defended , its good name needs to be defended and this is why I was telling you about my intention to set up a dedicated institution whose mandate will be to defend Poland’s good name world-wide. It should operate under the auspices of the President and Prime Minister and Minister of Foreign Affairs together. May it symbolize our unity. We, Poles, have a great history, we have no reasons to be ashamed, on the contrary, we should be proud of it. We should be telling the truth but we should be also standing for the truth in our relations with our neighbours since good-neighbourly relations, good people-to-people relations may be only founded on truth. This is why historical policy is needed both domestically and externally. I take my pledge to be active also in this regard. I have been elected President of the Republic of Poland. I have been elected by the nation, I can say so since in recent days and weeks, I have often found myself in a situation when people would approach me on the street to say: “Good morning, President, we have not voted for you but we wish you might deliver on what you have promised, what you were saying in the campaign.” When I hear such words, it is with the sense of great liability that I took on, and of great responsibility. On many occasions especially in campaign days, I heard voices saying: “it is impossible, impossible, do not count on it, it is impossible”. I am standing here today before you as President of the Republic of Poland and indeed, much can be attained if we act together and in concord! Much is possible to be attained if we show understanding, if we are kind to one another! Today Andrzej Duda is assuming the office of the President of the Republic of Poland and I trust it will be a success! Thank you very much!